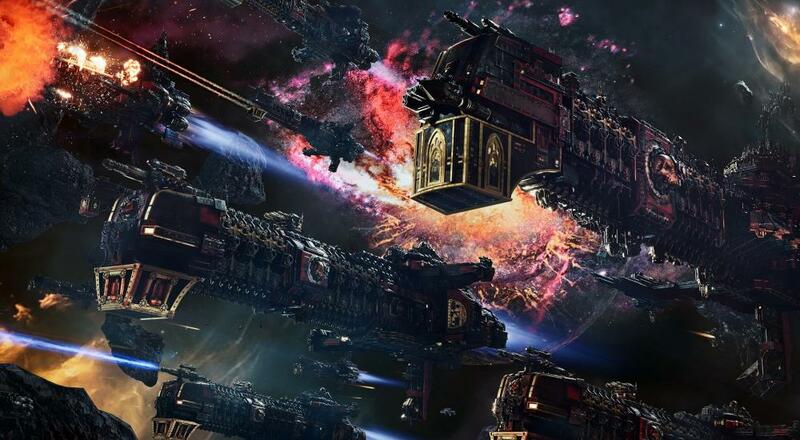 If you're unfamiliar with the Battlefleet Gothic series, it is an RTS adaptation of the miniatures version that was discontinued by Games Workshop back in 2013. You control a fleet of ships that vary in size and firepower, and attempt to strategically maneuver and engage with the opposing forces. To simplify things: it's your opportunity to recreate "Das Boot" with spaceships. When the game launches next week, there will be three full campaigns to play, each focused on a different faction. You can choose to play as the Imperial Navy (non-Space Marine humans), Necrons (future undead), or Tyranids (the OG Zerg). Each faction has their own ships with different abilities and ordnances to use. The campaigns will support two player online co-op throughout with the second player controlling half of the fleet at your command for a given mission. If you decide to hop in and play with a buddy, then, you'll work together to figure out who should go for the broadside and who should go ramming speed into the enemy dreadnoughts. Battlefleet Gothic: Armada 2 is out next Thursday, January 24, on PC via Steam. Two player online co-op is supported in all three campaigns, and in the Skirmish/Multiplayer modes by doing a team of humans against a team of A.I. (i.e., "comp stomping"). Page created in 0.5372 seconds.